KAS Turns Four: The State of Deceased Donor Kidney Allocation in the U.S. Recommended citation: Stewart DE, Wilk AR, Klassen DK. KAS Turns Four: The State of Deceased Donor Kidney Allocation in the U.S. OBM Transplantation 2019;3(1):17; doi:10.21926/obm.transplant.1901041. Background: This study examines very recent trends in deceased donor kidney transplantation to assess the performance of the kidney allocation system (KAS), implemented December 4, 2014, and whether bolus effects associated with KAS have stabilized nearly four years after implementation. Methods: The overall number of deceased donor kidney transplants, as well as the proportion of transplants by recipient and transplant characteristics, were calculated monthly from December 2013 through September 2018 and examined graphically. Transplant rates were calculated as the number of deceased donor kidney transplants divided by the number of patient years of time on the active waiting list among candidates listed in a donor service area (DSA). Kidney discard rates – the percentage of kidneys recovered for transplant but not transplanted – were analyzed overall and stratified by donor Kidney Donor Profile Index (KDPI). Delayed graft function (DGF) was defined as the recipient requiring dialysis within one week of transplant; monthly rates were examined graphically. We also surveyed other published research to round out our assessment of KAS’s impact. Results: Marked bolus effects, particularly a sharp increase in transplants to highly sensitized and high dialysis time recipients, were associated with KAS implementation but have since stabilized. Transplant access has improved for African American candidates, who now receive a proportion of transplants comparable to their representation on the waiting list. Subtype-compatible (“A2/A2B to B”) transplants have increased sharply but are still numerically small (~20/month) and may have plateaued. Transplant rates varied 17-fold across the 58 DSAs. Though the overall kidney discard rate has not changed appreciably over the past five years, the rate for KDPI 35-85% kidneys has trended slightly downward since 2017. After initially rising with KAS, DGF rates have tapered but still remain slightly above pre-KAS levels. One-year graft and patient survival rates remain excellent. Conclusions: The number of deceased donor kidney transplants has reached an all-time high and continues to rise, a boon for the nearly 100,000 patients with kidney failure on the waiting list. Several key bolus effects that were anticipated with KAS did indeed materialize, drastically changing the characteristics of the initial wave of post-KAS recipients. These bolus effects have since tapered, suggesting KAS has, by and large, reached a steady state. KAS has improved equity across ethnicities and levels of sensitization but did not attempt to resolve geographic inequities, and substantial geographic disparities remain. The goal of increasing utilization of kidneys at high risk of discard has not been met. Numerous policy changes and system improvement initiatives have been proposed, many of which are currently underway or pending implementation, to improve organ utilization. The “new” kidney allocation system (KAS) is no longer quite so new. December 4, 2018 marked the four year anniversary of this substantial overhaul of the nation’s policy governing how candidates are prioritized to receive kidneys available from deceased donors. The old, pre-KAS system for allocating kidneys in the U.S. was primarily a “first come, first serve” policy driven largely by waiting time. Though the old system included priorities for donor-recipient Human Leukocyte Antigen (HLA) tissue type matching aimed at maximizing graft longevity, it had no provision ensuring that the “best” kidneys – those expected to function the longest – be prioritized for transplant into patients with the greatest need for a long-lasting organ. Consequently, severe mismatches in the expected longevity between the organ and the recipient were not uncommon . Another weakness of the old system was the inadequate prioritization given to extremely highly sensitized patients. Before KAS, all patients with an 80% or higher chance of being incompatible with a randomly available donor were prioritized equally, despite disproportionately longer odds of finding a suitable donor for a subset of these “highly sensitized” patients. And though “first come, first serve” may seem to be an equitable method for allocation, prima facie, in reality exogenous racial and ethnic disparities in healthcare translated into unintentional disparities in access for minority candidates on the waiting list, who tended to be referred for transplant much later than non-minorities . Further limitations included a persistently high rate of discard among recovered and ostensibly transplantable deceased donor kidneys, as well as fragmentation due to the system being comprised of numerous policy “variances.” Consequently, a unified, national system for allocation did not exist; rather, countless similar yet disparate sub-systems propagated over the years, leading further changes to “national policy” cumbersome and costly to implement, since each variant needed to be modified and tested independently . To address these shortcomings, KAS’s goals included reducing organ/recipient longevity mismatches; increasing access to transplant for biologically and historically disadvantaged groups; increasing recovery and utilization of high KDPI kidneys; and streamlining the system to increase efficiency of implementing future policy changes . Much-anticipated bolus effects – a disproportionately large number of transplants received by specific groups of recipients early after implementation – have long since stabilized, and the system appears in many ways to have reached a steady state. The question remains: is KAS achieving its goals? In many ways the answer is yes, in particular with respect to goals related to equity and longevity matching. Yet goals surrounding increasing organ utilization and system efficiency remain elusive . This brief communication describes the state of kidney allocation in the U.S. approximately four years after this major policy change and highlights potential opportunities to build upon KAS’s foundation to further improve outcomes for waiting list candidates and kidney recipients. This study used data from the Organ Procurement and Transplantation Network (OPTN). The OPTN data system includes data on all donors, wait-listed candidates, and transplant recipients in the US, submitted by the members of the Organ Procurement and Transplantation Network (OPTN), and has been described elsewhere [5,6]. The Health Resources and Services Administration (HRSA), U.S. Department of Health and Human Services provides oversight to the activities of the OPTN contractor. The overall number and proportion of deceased donor kidney transplants by various recipient and transplant characteristics were calculated monthly from December 2013 through September 2018 and examined graphically. Kidney discard rates – the percentage of kidneys recovered for transplant not transplanted – were analyzed overall and stratified by donor Kidney Donor Profile Index (KDPI). Delayed graft function (DGF) was defined as the recipient requiring dialysis within one week of transplant; monthly rates were calculated and examined graphically. The proportion of transplants based on recipient time on dialysis and DGF rates were only shown through July 2018 due to lags in centers reporting data to the OPTN. IRB exemption was obtained from the US Department of Health and Human Services Health Resources and Services Administration (HRSA). Figure 1 The five-year trend in deceased donor kidney transplants per month in the U.S. The number of deceased donor kidney transplants has steadily risen since late 2013, when just under 900 were performed each month in the U.S. By mid-2018, this number has risen by over 25% to over 1150. The increasing trend in transplants that began prior to KAS has continued. Among kidneys expected to provide the shortest post-transplant graft longevity (KDPI>85%), but which may still benefit many patients on the waiting list , the discard rate has remained at approximately 60%. Though discard rates associated with these three KDPI groups – 0-20%, 21-34%, 86-100% -- have remained relatively stable, the KDPI 35-85% discard rate declined from 19.8% in 2016 to 16.2% partway through 2018 (Figure 2), suggesting improvement for the broadest KDPI group. Figure 2 Five-year trends in deceased donor kidney discard rates, stratified by donor KDPI. The kidney allocation system allocates kidneys differently depending on donor KDPI group: 0-20%, 21-34%, 35-85%, 86-100%. The percentage of kidneys recovered for the purpose of transplantation but not transplanted – i.e., the kidney discard rate – differs markedly depending on KDPI. Approximately 60% of recovered KDPI 86-100% kidneys are not transplanted, a percentage that has remain largely unchanged after KAS implementation in 2014. By contrast, only about 2% of KDPI 0-20% kidneys, which are projected to function much longer, are discarded. The proportion of deceased donor kidney transplants received by African American recipients rose sharply from approximately 32% to nearly 40% after KAS took effect, reflecting an initial bolus effect associated with waiting time priority being redefined to begin at time of chronic dialysis instead of listing. (Figure 3) With this rise, the longstanding disparity between the proportion of African American candidates on the waiting list and the proportion of those receiving transplant was resolved [3,11,12]. The percentage of transplants to African Americans has since tapered to approximately 34% (Figure 3), closely aligned with their current waiting list representation of 32% . Figure 3 Five-year trends in deceased donor kidney transplants by recipient characteristics. The percentage of deceased donor kidney transplants of varying characteristics are shown to highlight bolus effects and other dynamic aspects associated with KAS. After initially increasing sharply, the proportions of transplants going to very highly sensitized (CPRA 99-100%) and very high dialysis time (>=10 years) recipients have tapered substantially. The most salient bolus effect associated with KAS was clearly the early, sharp rise in the percentage of transplants received by highly sensitized patients (Calculated Panel Reactive Antibodies (CPRA) 99-100%), who now receive regional or national priority for compatible donors. Prior to KAS, this group – which accounts for about 7% of the waiting list – received just 2% of transplants; by contrast, immediately after KAS this group accounted for approximately 17% of transplants. As more of these difficult-to-match patients were removed from the waiting list due to transplantation, the proportion of transplants going to this group steadily declined and appears to have reached an equilibrium near 9%. The percentage of “non-local” transplants – those received by candidates listed at a transplant program outside of the Donor Service Area (DSA) in which the kidneys were recovered – rose sharply from about 20% to 33% before tapering to about 30%. (Figure 3) This increase was driven predominantly by the broader distribution of kidneys to CPRA 99-100% patients (Figure 4). Figure 4 Five-year trends in the % of transplants non-locally distributed, overall and CPRA 0-98%. The overall percentage of deceased donor kidney transplants distributed non-locally rose sharply with KAS. However, this percentage did not change with KAS for the subset of recipients having CPRA 0-98%, suggesting the increase in non-local transplantation was driven largely, if not exclusively, by the regional and national priority assigned respectively to CPRA 99% and 100% patients under KAS. After tapering slightly from 2015-2017 as bolus effects waned, the percentage of non-local transplants – particularly for CPRA 0-98 recipients – has inched higher. The percentage of transplants received by pediatric patients (age<18), who represent about 1% of the waiting list, declined slightly from just over 4% pre-KAS to just under 4% post-KAS, ostensibly due to the top-of-the-list priority now granted to very highly sensitized patients. Though the percentage has dropped, the absolute number of transplants going to pediatric recipients has increased, likely because of the overall rise in donors. In 2017, 486 pediatric patients received a deceased donor kidney transplant (OPTN data), compared to 463 in the year prior to KAS . The proportion of pediatric recipients receiving kidneys projected to function the longest post-transplant (KDPI<35%) kidney increased with KAS . Figure 5 The five-year trend in donor blood subgroup A, non-A1 (“A2”) and AB, non-A1B (“A2B”) transplants into blood group B recipients per month. After representing fewer than five transplants per month prior to KAS, the number of A2/A2BB “subtype compatible” transplants has risen sharply with KAS. The trend appears to have plateaued, however, and the numbers may suggest this feature of KAS has not reached its full potential to improve transplant access for blood group B candidates. The proportion of transplants received by age 65 and older patients fell from 23% to 18% with KAS but steadily rebounded to near pre-KAS levels in 2018. The likely driver behind changes in the age distribution of adult recipients is KAS’s longevity-matching component , which had a primary goal of avoiding or reducing transplants in which the kidneys expected to function the longest are received by patients not expected to need such long-lasting organs. In fact, the percentage of transplants having KDPI<35% and recipient age 65 or greater was cut in half with KAS – from 6% to 3% – and remains at 3% in 2018 (OPTN data). Figure 6 shows the rates candidates in active status on the waiting list receive deceased donor kidney transplants across the 58 DSAs. In the first half of 2018, the overall national transplant rate was 0.22. The transplant rate varied from 0.09 to 1.52, a 17-fold difference for the highest vs. lowest rate DSA. The 95% confidence intervals indicate the transplant rate differences among DSAs are generally not the product of small sample sizes and/or random variability. Figure 6 Deceased donor kidney transplants per active patient-year on the waiting list, by DSA of listing (January-June 2018). The “transplant rate” – the ratio of the number of kidney transplants (from local and non-local deceased donors) per active patient-year on the waiting list – varied 17-fold across donor service areas (DSAs) in the first half of 2018. This rate ranged from 0.09 to 1.52 across the 58 DSAs, indicating substantial geographic disparity in access to kidneys remains nearly four years after KAS. The 95% confidence intervals reveal that DSA differences cannot be explained by small sample sizes and/or random variability. Delayed graft function (DGF), defined as the recipient needing dialysis within a week of transplant, became more common with KAS, owing at least partially to more recipients having lengthy dialysis times as well as slightly increased cold ischemic times [3,16]. DGF rates have been found to have increased not just for adults but also for pediatric recipients, in particular pre-adolescents, a rise found to be associated with both longer pre-transplant dialysis times and donor factors . Figure 7 reveals that after the initial post-KAS spike in the proportion of all recipients experiencing DGF, the DGF rate moderated but still remains slightly above pre-KAS levels. Despite the rise in the pediatric DGF rate, one-year graft survival rates among pediatric recipients do not appear to have worsened based on very early data. One-year patient and graft survival rates among all recipients in the initial post-KAS cohort remain similar to, although slightly lower than, rates immediately preceding KAS. Graft survival rates declined from 94.1% to 93.6% (p=0.07) [12,18]. The slight decline in survival rates may be attributable to the early bolus of higher-risk (e.g., long dialysis durations; very high CPRA) transplants and thus might not reflect KAS outcomes under steady state. Further research is needed to assess both short and longer term outcomes now that the post-KAS recipient distribution appears to have reached an equilibrium. Figure 7 The five-year trend in the Delayed Graft Function (DGF) rate among deceased donor kidney transplants. Delayed graft function (DGF) rates among deceased donor kidney recipients increased with KAS from about 25% to over 30% but have since declined. The DGF rate remains slightly above pre-KAS. More deceased donor kidney transplants are occurring now in the U.S. than ever before. This rising trend appears to be largely associated with demographic changes in the donor pool, such as a sharp rise in drug overdose and DCD donors, not necessarily the allocation changes brought about by KAS. With the size of the kidney waiting list falling below 100,000, due to both more patients being removed for transplant as well as changes in listing practices [19,20], the kidney supply to demand gap is no longer widening, at least among waitlisted patients. 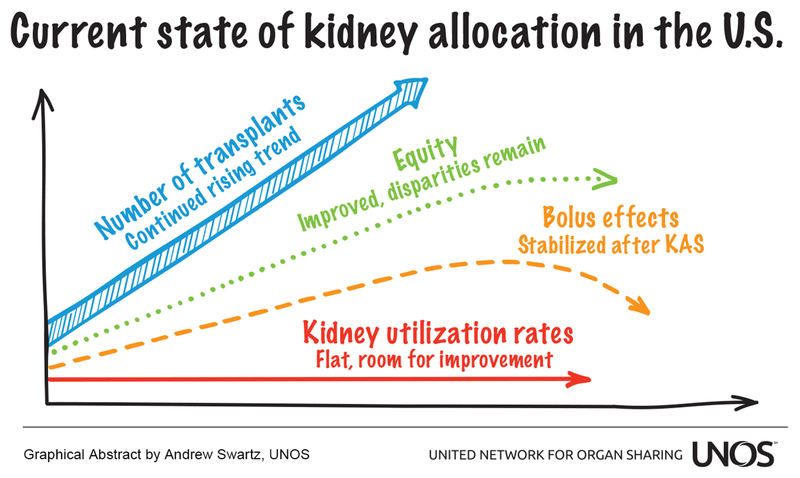 However, despite today’s slightly rosier picture compared to just a few years ago, substantial room for improvement remains in two key areas: optimizing the utilization of all transplant-quality kidneys, and addressing long-standing inequities in access to transplant, particular those related to geography. The underutilization of available deceased donor kidneys is well documented [21,22,23,24], and numerous groups have proposed policy changes and other initiatives aimed at improving the situation [25,26,27,28]. Several changes and initiatives aimed squarely at this challenge have been explored, recently implemented, or are nearing implementation. For example, the OPTN implemented a policy change in June 2018 reducing the amount of time allotted to transplant programs for accepting or refusing organ offers, as well as allowing candidates to have no more than two acceptances simultaneously, in an attempt to improve organ placement efficiency in DonorNet . Impact analyses are forthcoming. Kidney allocation policy changes pending implementation include two related proposals aimed at improving the utilization of dual (typically from older donors) and en bloc (typically from very small pediatric donors) kidneys [30,31]. Included in these changes is a provision to remove the combined local/regional allocation of KDPI>85% kidneys, an aspect of KAS in which local and regional centers are grouped together on the match run (instead of all local candidates first, then regional candidates) but which has not led to the desired goal of reduced discard rates. In addition, the OPTN has developed and enhanced tools aimed at improving organ utilization. These tools are available to transplant centers through UNOS’s UNetSM Data Portal. For example, the Report of Organs Offered (ROO) shows transplant centers the post-transplant outcomes for offers they previously declined, but which were accepted and transplanted elsewhere. The intent is to help drive Quality Assurance Process Improvement (QAPI) reviews and spur centers to reconsider their organ offer acceptance practices as well as their use of donor acceptance parameters for screening their candidates off the match run. The Recovery and Usage Map (RUM) report allows OPOs to compare stratified organ utilization rates with their peers, as well as identify transplant centers with a pattern of transplanting various types of kidneys, including those at high risk of discard. Another active project at UNOS involves creation of multifactorial offer filtering capabilities in UNetSM to complement and potentially replace the current, primarily one-at-a-time offer screening criteria. The Collaborative Improvement and Innovation Network (COIIN) , a 3-year Health Resources and Services Administration-directed OPTN project, was initiated with the specific goal of increasing the utilization of deceased donor kidneys with a KDPI of greater than 50%. This effort, beginning in late 2015, utilized a strategy of collaborative process improvement based on the development of best practices and other quality metrics with real-time data evaluation. Initial results suggest that this approach has resulted in increased utilization of high KDPI kidneys among the initial cohort of participating transplant programs . It is possible that the recent decline in the KDPI 35-85% discard rate (Figure 2) may in part be related to COIIN. Another potential boon to kidney utilization is the Centers for Medicare and Medicaid Services (CMS) recent proposal to relax transplant center conditions of participation related to maintaining sufficiently high, risk-adjusted, one-year graft and patient survival rates . KAS has substantially improved equity in access to transplant, largely by way of reducing variability in transplant rates across the candidate sensitization (CPRA) spectrum [40,41] and by improving access to ethnic minorities . Still, substantial access disparities remain . Though subtype-compatible transplants have increased sharply with KAS (Figure 5), the provision for transplanting A2 or A2B kidneys into compatible blood type B candidates, who are still biologically disadvantaged due to relatively few donors having blood type B [3,40], remains underutilized [42,43]. Though an OPTN study found blood type to be the candidate characteristic third-most associated with disparities in transplant access, the factor most associated with disparities is geography, most notably the DSA of a candidate’s transplant program [40,44]. Recent data confirm substantial geographic disparity persisted in early 2018. (Figure 6). Within the past 12 months, the OPTN Board of Directors approved the removal of DSA as a unit of allocation from both the allocation of lungs (implemented November 2017) [45,46] and livers (approved December 2018, pending implementation) , spurred by the motivation to reduce geographic inequities and in recognition of the OPTN Final Rule’s  mandate that organ distribution not be based on candidates’ place of residence . Other organ-specific committees, including the OPTN Kidney Transplantation Committee, have been charged by the Board to revise distribution policies to remove candidate prioritization based on geographic boundaries that are not rationally determined and consistently applied, specifically DSAs and Regions. Various approaches, including the use of concentric circles as well as a “borderless,” points-based approach  to allocation policy are being considered. A borderless approach would combine points based on the potential recipient’s proximity to the donated organs with points based on medical priority, equity, and other considerations deemed to be important to organ allocation. This flexible approach has the potential to greatly reduce geographic disparities while avoiding unnecessary organ travel based on trivial differences in potential recipients’ waiting time, medical urgency, or other characteristics. It would also force a critical reassessment of the degree to which priority should be awarded for pediatrics, prior living donors, highly sensitized candidates, donor/candidate longevity-matching, first time vs. repeat candidates , 0-ABDR mismatches, and other transplant types relative to priorities assigned based on proximity. Any proposals to broaden organ distribution must be conceived carefully with consideration of system costs, logistics, and avoiding or mitigating any potential detrimental effects on organ utilization . Reductions in acceptance practice variations among transplant hospitals and surgeons within transplant hospitals may also serve to improve equity [53,54,55]. Decision analytic tools [56,57] that aim to distill numerous potentially relevant clinical data points into actionable assessments for the specific decision at hand – is this particular organ expected to afford a survival advantage to this particular candidate at this moment, compared to available alternatives? – have the potential to help not only reduce variability but also increase organ utilization and improve outcomes among waiting list candidates and recipients. The prospects for candidates on the waiting list for a kidney transplant in 2018 have improved compared to four years ago, before the nation’s system for allocating this scarce resource was overhauled. Short-term outcomes remain excellent, with 19 of 20 transplanted kidneys surviving past the one year mark. However, improvements in long-term graft survival have lagged , and other key challenges remain in the areas of optimizing kidney utilization and improving geographic equity. The OPTN is committed to working arm-in-arm with the transplant community it represents to identify bold, innovative approaches to further improve the prognosis for all end stage organ failure patients. The authors would also like to acknowledge John Beck, MSME, for developing and updating the analytic queries needed to calculate most of the summary statistics displayed graphically in this paper. Darren Stewart: Designed and drafted manuscript; graphical analysis; Amber Wilk: data analysis; graphical analysis; reviewed and edited manuscript; David Klassen: reviewed and edited manuscript. Asch WS, Stewart, DS, Formica, RN. The National Kidney Allocation System. In: Singh AS, Riella LV, Editors. Scientific American Nephrology, Dialysis, and Transplantation [online]. Hamilton (ON): Decker Intellectual Properties, 2017. Organ Procurement and Transplantation Network website. About data. https://optn.transplant.hrsa.gov/data/about-data/ Accessed 12/5/2018. Organ Procurement and Transplantation Network (OPTN). https://optn.transplant.hrsa.gov/news/deceased-organ-donors-in-us-exceeded-10-thousand-for-first-time-in-2017/ Accessed 11/25/2018. Stewart D, Kucheryavaya A, Brown R, Klassen D, Turgeon N, Aeder M. Understanding the initial rise in kidney discard rates observed post-KAS. Am J Transplant. 2016; 16: 278-278. Wilk A, Beck J, Kucheryavaya A. “The kidney allocation system (KAS): The first two years,” Organ Procurement and Transplantation Network (OPTN) Kidney Transplantation Committee Report, April 19, 2017. Organ Procurement and Transplantation Network online data reports. https://optn.transplant.hrsa.gov/data/view-data-reports/national-data/ Accessed 12/5/2018. Stewart D, Kucheryavaya A, Klassen D. Understanding the drivers behind an rarly post-KAS rise in delayed graft function (DGF) rates. Am J Transplant. 2016; 16: 238-238.
Cooper M, Formica R, Friedewald J, Hirose R, O'Connor K, Mohan S, et al. Report of National Kidney Foundation Consensus Conference to decrease kidney discards. Clin Transplant. 2018: e13419. doi.org/10.1111/ctr.13419. Organ Donation and Transplant Alliance, Critical Issues Forum Great Ideas Strategy Guide, https://organdonationalliance.org/wp-content/uploads/2018/12/NCIF-2018-Strategy-Guide-Final_112918.pdf, Nov 1-2, 2018, accessed 12/13/2018. Organ Procurement and Transplantation Network (OPTN) Policy Notice, Improving the Efficiency of Organ Placement, https://optn.transplant.hrsa.gov/media/2368/opo_policynotice_20171221.pdf, accessed 12/6/2018. Organ Procurement and Transplantation Network (OPTN) policy notice, Improving Dual Kidney Allocation, https://optn.transplant.hrsa.gov/media/2370/kidney_policynotice_20171221.pdf, accessed 12/6/2018. Organ Procurement and Transplantation Network (OPTN) policy notice, Improving En Bloc Kidney Allocation, https://optn.transplant.hrsa.gov/media/2369/kidney_enbloc_policynotice_20171221.pdf, accessed 12/6/2018. Organ Procurement and Transplantation Network (OPTN), Proposed Operational Rule involving Transplant Program Performance Measures, https://optn.transplant.hrsa.gov/media/1925/mpsc_txprogram_measures_20160815.pdf, accessed 12/6/2018. Organ Procurement and Transplantation Network (OPTN), Concept Paper on Expedited Organ Placement, https://optn.transplant.hrsa.gov/governance/public-comment/concept-paper-on-expedited-organ-placement/, accessed 12/6/2018. Vinkers MT, Smits JM, Tieken IC, de Boer J, Ysebaert D, Rahmel AO. Kidney donation and transplantation in Eurotransplant 2006-2007: Minimizing discard rates by using a rescue allocation policy. Prog Transplant. 2009; 19: 365-370. Klassen D, Haskell H, Sisaithong K, McBride M, Carrico R, Curry M. Transplant hospitals increase volumes and acceptance rates under the COIIN project. Am J Transplant. 2018; 18: 256-256. Medicare and Medicaid Programs; Regulatory Provisions To Promote Program Efficiency, Transparency, and Burden Reduction, A Proposed Rule by the Centers for Medicare & Medicaid Services on 09/20/2018, https://www.federalregister.gov/documents/2018/09/20/2018-19599/medicare-and-medicaid-programs-regulatory-provisions-to-promote-program-efficiency-transparency-and, accessed 12/6/2018. OPTN/UNOS Policy Notice Modifications to the Distribution of Deceased Donor Lungs, https://optn.transplant.hrsa.gov/media/2539/thoracic_policynotice_201807_lung.pdf, accessed 12/6/2018. Organ Procurement and Transplantation Network (OPTN), Monitoring of the Lung Allocation Change, 6 Month Report Removal of DSA as a Unit of Allocation, https://optn.transplant.hrsa.gov/media/2517/20180621_thoracic_committee_report_lung.pdf, accessed 12/6/2018. OPTN/UNOS Board approves updated liver distribution system, https://optn.transplant.hrsa.gov/news/optnunos-board-approves-updated-liver-distribution-system/, accessed 12/6/2018. The Organ Procurement and Transplantation Network Final Rule of 2000, 42 U.S.C. §§ 121 https://www.ecfr.gov/cgi-bin/text-idx?SID=bb60e0a7222f4086a88c31211cac77d1&mc=true&node=pt42.1.121&rgn=div5 accessed 10/11/2017. Glazier AK. The lung lawsuit: A case study in organ allocation policy and administrative law. J Health Biomed Law. 2018; 14: 139. OPTN/UNOS Board adopts principles of geographic organ distribution, https://optn.transplant.hrsa.gov/news/optnunos-board-adopts-principles-of-geographic-organ-distribution/, accessed 12/7/2018. Stewart D, Lindemans J, Schold J, McGehee H, Kessler J, Sullivan C, et al. DonorNet and biases in decision-making: An organ offer simulation study. Am J Transplant. 2018; 18: 661-661.